Earlier this year, when we reported on DJ Ginsberg’s and Marilyn Wagner’s mammoth collection of movie-ad print blocks and printing plates, scores of these stellar pieces of cinema history from the early 1930s to early 1980s caught our eye. There were ads for Bogart and Bergman in “Casablanca,” Elvis Presley in “King Creole,” Sean Connery in “Dr. No,” and Judy Garland in “The Wizard of Oz.” If the Academy of Motion Picture Arts and Sciences had a category for Best Print-Advertising Archive, Ginsberg and Wagner would surely have themselves an Oscar. 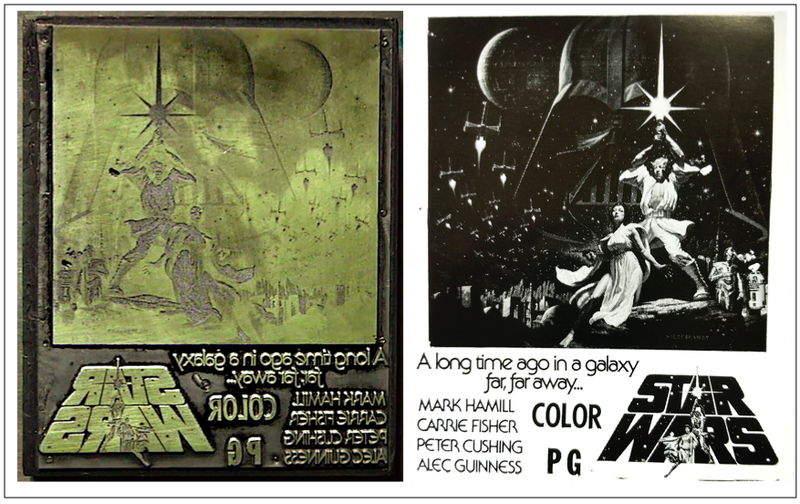 One of these reverse-image movie ads, though, was in a class by itself—the print block for the very first “Star Wars” film (we refuse to call it “Episode IV” or “A New Hope”), released in 1977. When struck, or printed, on a sheet of paper, the reverse image on that block becomes a positive of an uncharacteristically ripped Luke Skywalker, his shirt open to reveal a tight six-pack, alongside a similarly uncharacteristically buxom Princess Leia. And just below these two (spoiler alert!) siblings is the last name of two more, “Hildebrandt,” as in the Brothers Hildebrandt, Tim and Greg. They were working together in 1977 when they were hired by a New York ad agency called Smolen, Smith and Connolly to create a painting would soon be referred to as the “Style B” poster for “Star Wars,” which was also used as the basis for the “Star Wars” print block. Since our story was published in March of 2018, Ginsberg and Wagner have decided to strike the Hildebrandt-designed print block in an edition of 3,000. Each 8 1/2-by-11-inch strike is printed on heavy white archival paper and signed and numbered by Ginsberg, who is also the printer. This means “Star Wars” fans can now collect yet another variation of one of the most enduring images in the “Star Wars” franchise. 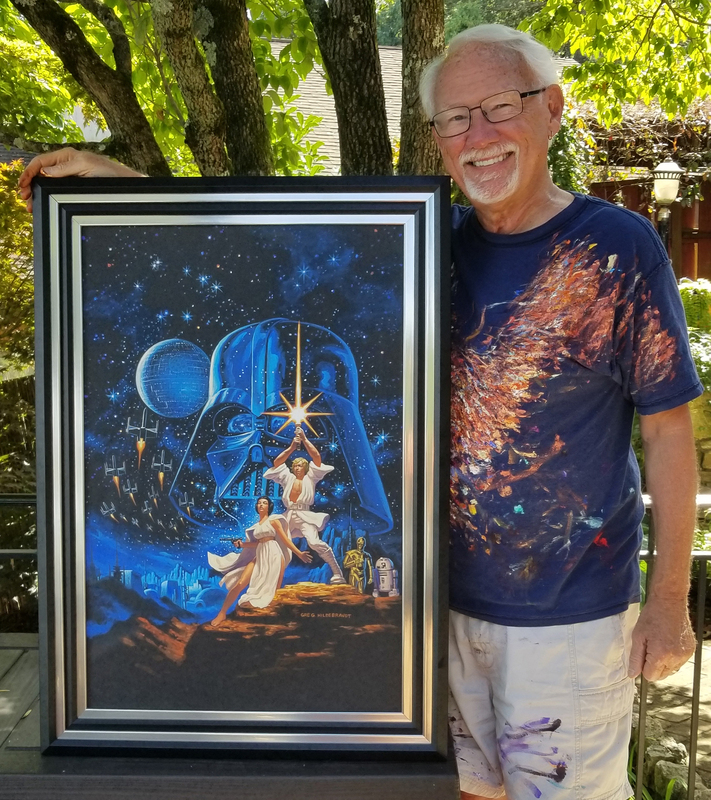 Top: Greg Hildebrandt with his new re-creation of the painting he and his brother, Tim, produced for a “Star Wars” poster in 1977. Above: The same 1977 image on one of DJ Ginsberg’s and Marilyn Wagner’s print blocks (left), with a strike of the block (right). Coincidentally, Greg Hildebrandt (Tim died in 2006) has just painted a fresh copy of the artwork he submitted to Smolen, Smith and Connolly more than 40 years ago. This new “Star Wars” painting will be on view at the Spiderweb Art Gallery booth (#1764) at New York Comic Con (October 4-7, 2018) before it’s put up for auction at Gotta Have Rock and Roll (November 21-30, 2018). 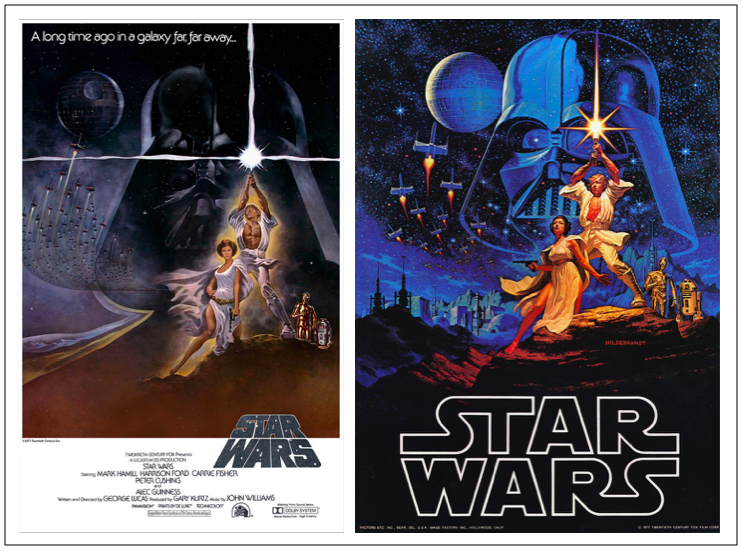 Tom Jung designed the first “Star Wars” poster (left) with Luke and Leia in heroic poses and Darth Vader looming behind them, but Lucas wanted the design to be more “comic-booky,” so the Brothers Hildebrandt were hired. Their version (right) is more colorful, with a pulp paperback feel. 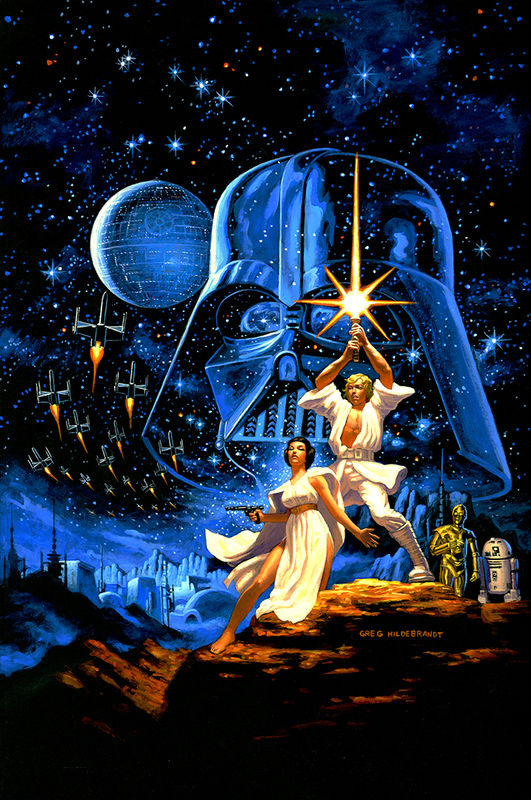 That direction is obvious when comparing Jung’s “Style A” poster, as it’s known, with the Brothers Hildebrandt’s “Style B.” There’s a spooky, sinister blue light on Darth Vader’s helmet and the Death Star in the Hildebrandts’ version, the light on Leia and Luke is warmer, fire rather than mere exhaust appears to propel the fleet of X-wing Rebel Starfighters, and the Hildebrandts added a glimpse of life on Tatooine to the scene. In just 36 hours, they had, indeed, brightened and enlivened Jung’s original composition, but for Greg, something was still missing. Greg Hildebrandt’s 2018 re-creation of his and his brother’s 1977 “Star Wars” painting will be on view in October at New York Comic Con before going up for auction in November. Totally cool paintings and good stories behind them. The newest by Greg looks perfect. Gonna show these to my huge Star Wars fan buddy as we install the parts he ordered from 4WheelOnline for his truck this coming weekend. Is This Treasure Trove of Movie Ads From the Heyday of Newspapers Worth $20 Million? “ ” John Lennon’s co-composer may have been an orange.